With smart technology lighting up the lives (literally) of home owners, business owners and property moguls alike, it’s no wonder that this popular trend has not only caught on, but is set to sky rocket in value as forecasts show the size of the global smart home market to have more than doubled since 2016, standing at a healthy $24.1 billion, and estimated to rise to $53.45 billion in 2022. From being able to learn who’s at the door, simply with a mere ring of the doorbell, to being able to remote monitor your residence from anywhere, near or far, with functions such as disarming the alarm, turning on the light, and unlocking the door remotely. Whether at home, or in the office, smart technology works to make life that much simpler for its users, while remaining completely in control. After all, people like to and need to feel in control of their environment and their surroundings in order to feel comfortable. With so many benefits available, smart technology continues to enter new realms, from serene plush apartments to bustling commercial offices, this must-have technology isn’t just for the techies, nor the super-rich, it’s readily available to a vast variety of people and is becoming more commonly utilised than ever before. When your mobile device is part of the intercom experience, you’ll always know who’s at the door. So, when someone rings the bell or presses the intercom button, you can see and hear who is calling before you decide to answer. This functionality is also available throughout the building, with crisp, clear video displaying on touch screens in each room, ensuring you stay in control of who enters, and who doesn’t. The likes of contemporary in-wall and tabletop touch screens enable instant communication, high-quality audio, high-definition video, and better control of your surroundings. Functionality between screens means you can quickly broadcast a message from one touch screen to all the rest, or from one room to another, helping to improve communication within a personal or work setting. With the likes of globally accessible intercom, family and/or business partners can always stay connected, no matter where they happen to be. Features such as auto-answer enablement, mean you can dial into and be instantly video-connected to any room from your mobile device via touch screens. 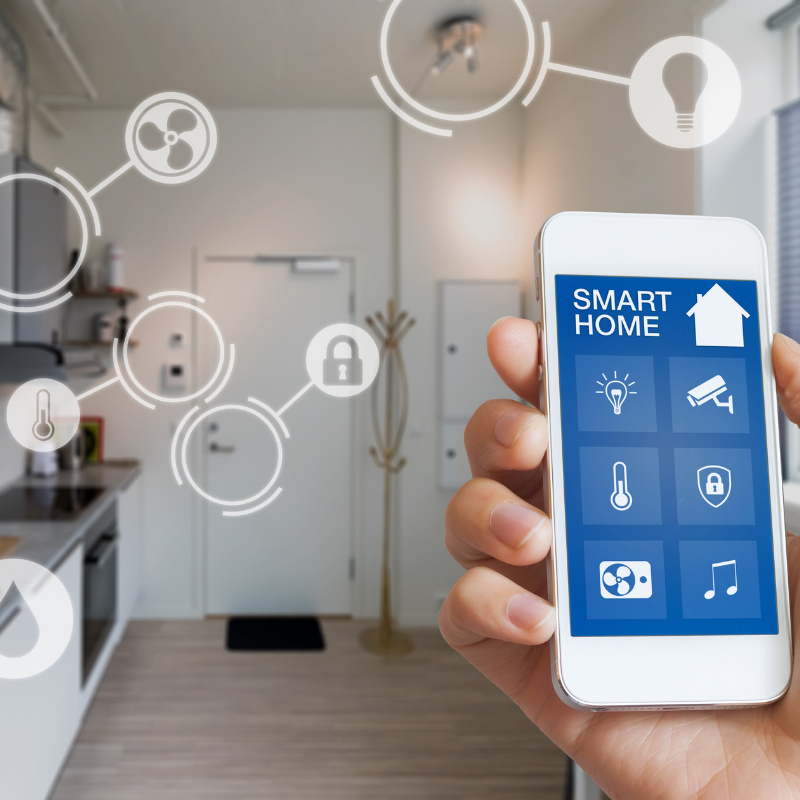 For those who have a smart home, or smart business, they will be given the tools to personalise and finely-tune their environment to meet on-going and ever-evolving lifestyle and business needs. From the likes of having your favorite music in premium, high-resolution quality, to having a more aesthetically pleasing light to suit your chosen ambience delivered to your chosen room. With smart lighting, you can control a single light or every light, with a tap of a button. This means, you can conserve energy and encourage energy efficiency throughout your building. To get the most out of a high-performance building, control is essential. And such increasingly sophisticated smart technology allows for increasingly sophisticated control of a building. When smart controls are used in conjunction with access and intruder technology, they complement one another, providing heightened efficiency. For instance, with a quick tap of a button via the app, you can disarm an alarm, turn on the light, and unlock the door remotely. And just as easily, you can secure the premises, turn off the light and re-arm it, whether you’re located across the street or half way across the world. As each of these intelligent features connect via the IoT and integrate, security systems continue to become more advanced, for example, the integration of video surveillance with sensor fusion resulting in functionalities such as remote monitoring, the ability to manage multiple sites, remote access and so on. From the network foundation to the personalised touches, Control4 are experts in designing and installing whole-building automation systems that are matched perfectly to the lifestyle of any individual, delivering world-class smart-home solutions to customers for both home and business purposes. At Inner Range, we have recently released an upgrade to our Inception product to include the Control4 Smart Home System. This means our powerful and very flexible security solution now has the added benefit of smart technology, enabling you to personalise your home or business environments, improve communication and maintain control, be it in-house or from a far. For information and to organise a demonstration email us today.